An artist's impression of the proposed Doughiska development. An application for planning permission for a development at Doughiska has been lodged this week with supporters believing it could create up to 1,000 jobs for that side of the city. Last evening, city councillor and former mayor Michael Crowe said that if granted, this development has the potential to competely transform the Doughiska area, bringing benefits to both the local community and businesses. The application details what has been described as a radical and innovative mixed use development on a high profile site measuring in excess of seven acres. The development will be constructed at the site on the Coolagh gateway roundabout to Galway from the M6 motorway. The proposed nodal development comprises a 100,000 sq ft, of office space, a residential scheme of 130 apartments ranging in size between one and four bedrooms, together with a 122 -edroom Hotel with adjoining suites which will provide an additional 24 bed spaces. The development includes a gymnasium, six lane 25-metre swimming pool, tennis court, astro turf playing facilities, creche, café serviced with a mix of undercroft and multi storey car parking. The projected gross development value of the scheme exceeds €130 million and backers say it represents a step change in urban living in Galway City. 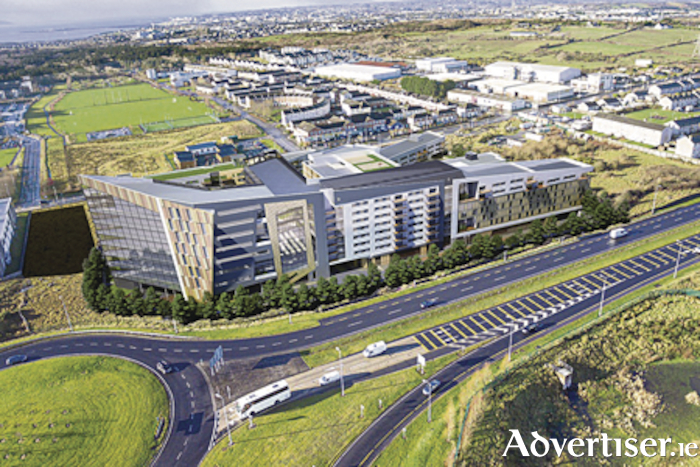 Cllr Crowe said that while designing to an appropriate density, height, and scale, the development team have sought to deliver a high quality public realm to integrate seamlessly with the local residential and business communities, public transport nodes and other neighbourhood amenities.